Bring the Elder Scrolls to Dexion. Find the Dragon Elder Scroll. Find the Blood Elder Scroll. Bring the Elder Scrolls to Dexion Evicus. You will need to have both the Blood and Dragon Elder Scrolls in your possession. To obtain the Blood scroll you will need to journey to the Soul Cairn during Chasing Echoes. To obtain the Dragon scroll you will need to take the scroll from the Tower of Mzark within Blackreach, only accessible by beginning the quest Discerning the Transmundane. If you have already completed that quest and obtained the scroll, then you have saved yourself some work as you will only have to find the Blood scroll. If you have sold the scroll to Urag gro-Shub at the College of Winterhold, you can buy it back from him for 4,000 gold. If you are the Arch-Mage, you can persuade him to sell it for 2,000 gold. Once you have the two Elder Scrolls, return to Dexion to find that, because he did not prepare himself earlier, he has gone blind and will not be able to aid you further. He will, however, give you the means to read an Elder Scroll yourself. This quest appears in your journal simply as a reminder of which Elder Scrolls you have obtained; it is not a typical quest. If you joined the Volkihar side, when you return to Volkihar Keep, Dexion may be shackled to the wall, presumably because he is no longer of any use to Lord Harkon. If you fail to pick up the Dragon Elder Scroll in the Tower of Mzark before completing the quest Discerning the Transmundane, when you try to pick up the scroll, it may disappear and not show up in your inventory, preventing you from advancing the quest. 10 In order to locate Auriel's Bow, the Moth Priest, Dexion, indicated that two other Elder Scrolls would be required. The first scroll foretells the interactions of the dragons with the history of Nirn. The second foreshadows the defiance of the gods with the blood of mortals. 40 I've secured both of the Elder Scrolls needed to fully decipher the Tyranny of the Sun and pinpoint Auriel's Bow. I need to return to Fort Dawnguard where Dexion has been waiting to begin his reading. I've secured both of the Elder Scrolls needed to fully decipher the Tyranny of the Sun and pinpoint Auriel's Bow. 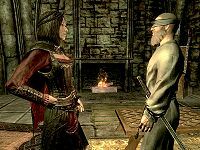 I need to return to Castle Volkihar where Dexion is imprisoned so he can begin his reading. 200 Finishes quest After bringing the Elder Scrolls to Dexion, a disturbing development has arisen. When reading the first scroll in front of Harkon's court, he wasn't able to fully prepare himself and he's become blind. It's now up to me to bring all three Elder Scrolls to the Ancestor Glade where I can supposedly unearth an ancient method of reading them myself. Finishes quest After bringing the Elder Scrolls to Dexion, a disturbing development has arisen. When reading the first scroll in front of the Dawnguard, he wasn't able to fully prepare himself and he's become blind. It's now up to me to bring all three Elder Scrolls to the Ancestor Glade where I can supposedly unearth an ancient method of reading them myself. The following empty quest stages were omitted from the table: 1, 20, 25, 30. On the PC, it is possible to use the console to advance through the quest by entering setstage DLC1VQElder stage, where stage is the number of the stage you wish to complete. It is not possible to un-complete (i.e. go back) quest stages, but it is possible to clear all stages of the quest using resetquest DLC1VQElder. This page was last modified on 25 January 2017, at 05:40.